The island of Delos (/ˈdiːlɒs/; Greek: Δήλος [ˈðilos]; Attic: Δῆλος, Doric: Δᾶλος), near Mykonos, near the centre of the Cyclades archipelago, is one of the most important mythological, historical, and archaeological sites in Greece. The excavations in the island are among the most extensive in the Mediterranean; ongoing work takes place under the direction of the French School at Athens, and many of the artifacts found are on display at the Archaeological Museum of Delos and the National Archaeological Museum of Athens. Delos had a position as a holy sanctuary for a millennium before Olympian Greek mythology made it the birthplace of Apollo and Artemis. From its Sacred Harbour, the horizon shows the three conical mounds (image below) that have identified landscapes sacred to a goddess in other sites: one, retaining its Pre-Greek name Mount Kynthos, is crowned with a sanctuary of Zeus. Delos, if you would be willing to be the abode of my son Phoebus Apollo and make him a rich temple –; for no other will touch you, as you will find: and I think you will never be rich in oxen and sheep, nor bear vintage nor yet produce plants abundantly. But if you have the temple of far-shooting Apollo, all men will bring you hecatombs and gather here, and incessant savour of rich sacrifice will always arise, and you will feed those who dwell in you from the hand of strangers; for truly your own soil is not rich. Investigation of ancient stone huts found on the island indicate that it has been inhabited since the 3rd millennium BCE. Thucydides identifies the original inhabitants as piratical Carians who were eventually expelled by King Minos of Crete. By the time of the Odyssey the island was already famous as the birthplace of the twin gods Apollo and Artemis (although there seems to be some confusion of Artemis’ birthplace being either Delos or the island of Ortygia). Indeed, between 900 BCE and 100 CE, sacred Delos was a major cult centre, where Dionysus is also in evidence as well as the Titaness Leto, mother of the above-mentioned twin deities. Eventually acquiring Panhellenic religious significance, Delos was initially a religious pilgrimage for the Ionians. A number of «purifications» were executed by the city-state of Athens in an attempt to render the island fit for the proper worship of the gods. The first took place in the 6th century BCE, directed by the tyrant Pisistratus who ordered that all graves within sight of the temple be dug up and the bodies moved to another nearby island. In the 5th century BCE, during the 6th year of the Peloponnesian war and under instruction from the Delphic Oracle, the entire island was purged of all dead bodies. It was then ordered that no one should be allowed to either die or give birth on the island due to its sacred importance and to preserve its neutrality in commerce, since no one could then claim ownership through inheritance. Immediately after this purification, the first quinquennial festival of the Delian games were celebrated there. After the Persian Wars the island became the natural meeting-ground for the Delian League, founded in 478 BCE, the congresses being held in the temple (a separate quarter was reserved for foreigners and the sanctuaries of foreign deities.) The League’s common treasury was kept here as well until 454 BCE when Pericles removed it to Athens. The island had no productive capacity for food, fiber, or timber, with such being imported. Limited water was exploited with an extensive cistern and aqueduct system, wells, and sanitary drains. Various regions operated agoras (markets). Strabo states that in 166 BCE the Romans converted Delos into a free port, which was partially motivated by seeking to damage the trade of Rhodes, at the time the target of Roman hostility. In 167 or 166 BCE, after the Roman victory in the Third Macedonian War, the Roman Republic ceded the island of Delos to the Athenians, who expelled most of the original inhabitants. Roman traders came to purchase tens of thousands of slaves captured by the Cilician pirates or captured in the wars following the disintegration of the Seleucid Empire. It became the center of the slave trade, with the largest slave market in the larger region being maintained here. 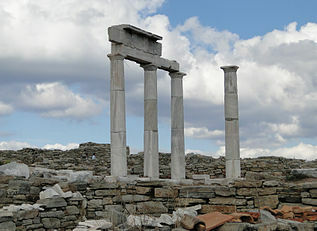 The Roman destruction of Corinth in 146 BCE allowed Delos to at least partially assume Corinth’s role as the premier trading center of Greece. However, Delos’ commercial prosperity, construction activity, and population waned significantly after the island was assaulted by the forces of Mithridates VI of Pontus in 88 and 69 BCE, during the Mithridatic Wars with Rome. Before the end of the 1st century BCE, trade routes had changed; Delos was replaced by Puteoli as the chief focus of Italian trade with the East, and as a cult-centre too it entered a sharp decline. Due to the inadequate natural sources of food and water, and the above history, unlike other Greek islands, Delos did not have an indigenous, self-supporting community of its own. As a result, in later times it was uninhabited. Since 1872 the École française d’Athènes («French School of Athens») has been excavating the island, the complex of buildings of which compares with those of Delphi and Olympia. In 1990, UNESCO inscribed Delos on the World Heritage List, citing it as the «exceptionally extensive and rich» archaeological site which «conveys the image of a great cosmopolitan Mediterranean port». The small Sacred Lake in its circular bowl, now intentionally left dry by the island’s caretakers to suppress disease spreading bacteria, is a topographical feature that determined the placement of later features. Temple of the Delians, Delos; 19th century pen-and-wash restoration. The Minoan Fountain was a rectangular public well hewn in the rock, with a central column; it formalized the sacred spring in its present 6th century BCE form, reconstructed in 166 BCE, according to an inscription. Tightly-laid courses of masonry form the walls; water can still be reached by a flight of steps that fill one side. There are several market squares. The Hellenistic Agora of the Competaliasts by the Sacred Harbour retains the postholes for market awnings in its stone paving. Two powerful Italic merchant guilds dedicated statues and columns there. The Temple of the Delians, dedicated to Apollo, is a classic example of the Doric order. (A pen-and-wash reconstruction of the temple is illustrated at the Doric order article.) Beside the temple once stood a colossal Kouros of Apollo, only parts of which remain extant. Dating to the 6th Century BCE, parts of the upper torso and pelvis remain in situ, a hand is kept at the local museum and a foot in the British Museum. The Terrace of the Lions, also dedicated to Apollo by the people of Naxos shortly before 600 BCE. It originally had nine to twelve squatting, snarling marble guardian lions along the Sacred Way; one is inserted over the main gate to the Venetian Arsenal. The lions create a monumental avenue comparable to Egyptian avenues of sphinxes. (There is a Greek sphinx in the Delos Museum.) Today only seven of the original lions remain. The Oikos of the Naxians (House of the Naxians) first quarter of 6th century BCE: a long hall with one central ionic colonnade, a west porch tristyle in antis and an east marble prostasis of the middle of the 6th century BCE. The meeting hall of the Poseidoniasts of Beirut housed an association of merchants, warehousemen, shipowners and innkeepers during the early years of Roman hegemony, late 2nd century BCE. To their protective triad of Baal/Poseidon, Astarte/Aphrodite and Eshmun/Asklepios, they added Roma. The platform of the Stoivadeion dedicated to Dionysus bears a statue of the god of wine and the life-force. On either side of the platform, a pillar supports a colossal phallus, the symbol of Dionysus. The southern pillar, which is decorated with relief scenes from the Dionysiac circle, was erected around 300 BCE to celebrate a winning theatrical performance. The statue of Dionysus was originally flanked by those of two actors impersonating Paposilenoi (conserved in the Archaeological Museum of Delos). The marble theatre is a rebuilding of an older one, undertaken shortly after 300 BCE. The Doric Temple of Isis was built on a high over-looking hill at the beginning of the Roman period to venerate the familiar trinity of Isis, the Alexandrian Serapis and Anubis. The Temple of Hera’, circa 500 BCE, is a rebuilding of an earlier Heraion on the site. The House of Dionysus’ is a luxurious 2nd century private house named for the floor mosaic of Dionysus riding a panther. The House of the Dolphins is similarly named from its atrium mosaic, where erotes ride dolphins; its Phoenician owner commissioned a floor mosaic of Tanit in his vestibule. The Delos Synagogue, the oldest synagogue known today. 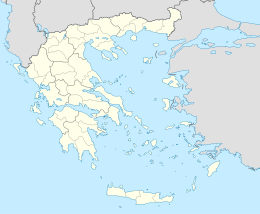 The 2001 Greek census reported a population of 14 inhabitants on the island. The island is administratively a part of the municipality of Mýkonos.